Sure it can be a healthy snack for kids!!! You must try this out! 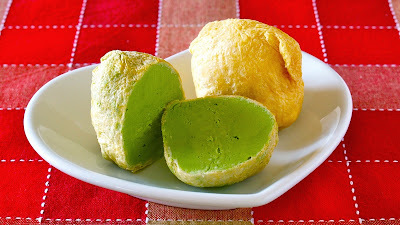 BTW, Aburaage (deep fried tofu) works perfect when frozen, so it CAN NOT be a substitute for regular cream puff shells! 1. Pour boiling water over Aburaage to remove the excess oil. Drain and dry with paper towels. 2. Cut Aburaage into half. 3. Open the Aburaage and fill with some ice cream. Freeze until firm.